For most folks, a deck is only as good as its railing. It doesn't do much good to have an elevated platform for grilling and enjoying the afternoon if you can't let the kids out with you because there is no railing to prevent falls. Poor quality rails are not the answer, either. If the material degrades after some regular wear and tear or splinters over time, it can pose a risk for anyone who leans against it. These shortcomings aren't only detrimental for the homeowner. Commercial decks have perhaps an even greater need for adequate railings. In the case of public decks, many more people may be at risk on elevated decks with structurally unsound rails or an absence of railings altogether. "A weak railing can pose a risk for anyone who leans against it." That's why it is crucial for builders to be aware of deck railing codes and to build using the best materials. Capped composite railings don't splinter and are resistant to mold and mildew - meaning they won't rot and become unstable over time. With versatile colors and a number of add-on options, capped composite rails are the best choice for any new deck. Like anything built, railing are subject to codes from either the International Residence Code (for private houses) or the International Building Code (for apartments and commercial buildings), according to Decks.com. Both of these sets of regulations exist to ensure that contractors and do-it-yourself homeowners install railings durable and high enough to prevent accidents from happening. To begin with, any deck standing 30 inches or more above ground must have a guardrail. For anyone installing a railing on a deck lower than 30 inches above grade, that rail must still meet code requirements. The IRC stipulates that railings be at least 36 inches high, measured from the surface of the deck to the top of the railing. Meanwhile, the IBC maintains deck railings be at least 42 inches high. As far as design is concerned, the rules allow for a number of styles, provided that the interior of the railing contain no spaces large enough to pass through a sphere with a 4-inch diameter. Additionally, the rail must be capable of withstanding a minimum 200-pound downward force at any point. A great deck needs a great railing. Simply meeting the codes is enough to be sure a newly installed rail is safe, but the codes don't dictate how long that rail will last before the elements take their toll. Once that happens, the railing might well be compromised and provide little resistance to a person leaning up against it. To be sure the rail will last and perform well over time, contractors should opt for capped composite material. This product doesn't splinter the way wood and inferior composite wood varieties do. The texture also mimics the look and feel of wood, while providing a reliable grip and without succumbing to rot. 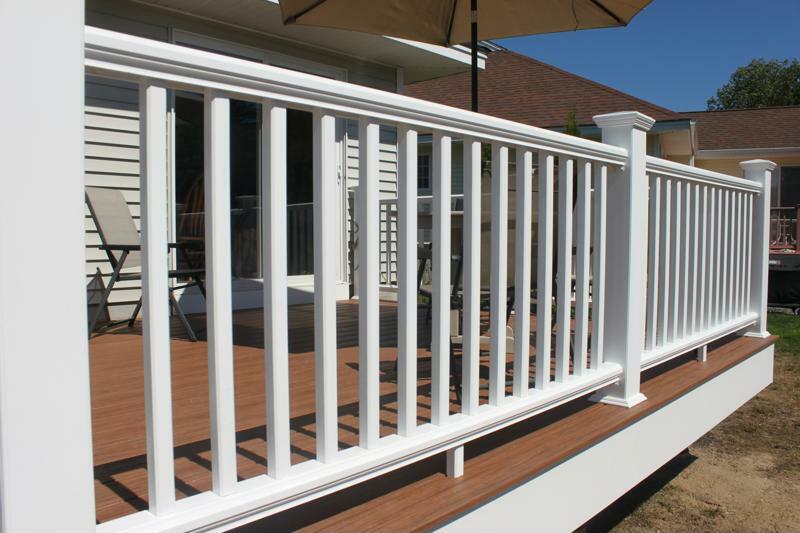 For more information on how capped composite railings can benefit your deck, request a sample from Duralife Decking.